Today's surprise was a handy little notebook, 5.5" x 3.5" and the smallest highlighter I've ever seen, 2.25" - perfect for tucking into a knitting bag. 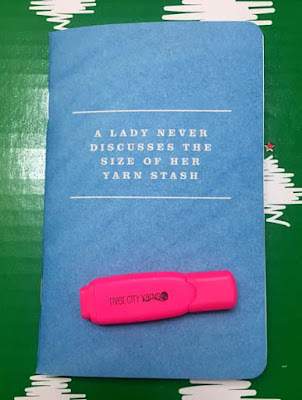 On the cover is the quote, "A lady never discusses the size of her yarn stash". I guess that my friends and I are not ladies as our stashes are often a topic of conversation!! Yesterday's box contained the pattern and yarn to make Christmas trees. Last night I completed the first one. The pattern was easy and fun and the tree turned out just the way it was supposed to. I'm very pleased. Now, however, I'm wondering if the tree needs some decorations. It's looking a little bare. I'll give that some thought. 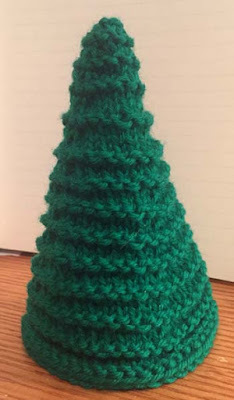 The second tree, made with the eyelash yarn, is on the needles. 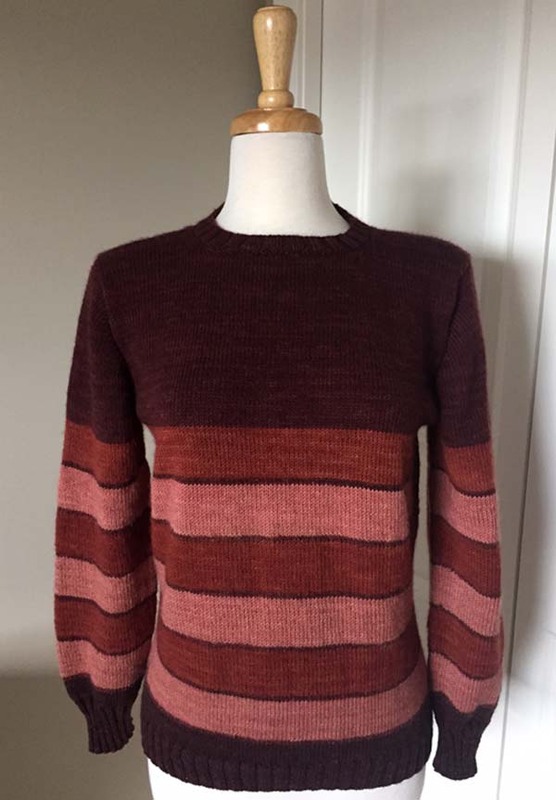 My goodness, I'm more behind in reporting FOs (finished objects) that I'd realized - I'd missed a sweater. Back on May 13th I talked about struggling with the colors for a striped sweater that I was making. The yarn came from the stash of a dear friend who had passed away. I really wanted to make the sweater using only her yarn, but had to give in and order one skein to finish. I knitted and ripped and knitted again, trying to make the most pleasing striping sequence. I tried adding in other colors, but adding some beige, greens, grays or blues, etc.. just didn't work. I'm pleased with the end result. The sweater fits well and gets plenty of use. I think that P. would have been pleased. She was a huge fan of Plucky Yarns. I think of her when I wear it. Pattern: I called this "A Very Plucky Pullover"
I did mine separately, so only one tree is fuzzy. That's the fun about knitting your own trees. You can make them anything you want!